These are the reason why I love Siena so much. The open restaurant delineating the Piazza del Campo. Hidden alleys which you think you'll get lost but you won't. Classic old scooter which are still being use. Hanging clothes between windows to dry with natural air. Funny circle sign on your head whatever it means. Sitting in the middle of Piazza del Campo. Beautiful Old building at your back to make your picture pretty. Everybody is sitting in the middle of the Piazza. And ended with me. I just have to put this paparazzi picture. 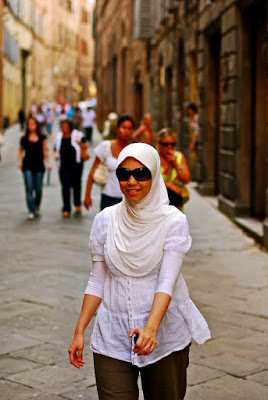 Credit : Siena visit and photos taken were inspired by Shaliza Mokhtar. Yes indeed..Gorgeous isn't it.. I fell in love at first sight. Gua nak ajak lu datang makan kenduri kat Blog gua.Folo baca doa skali pun takpa..
jOm ladies, view my blog!! OMG. It looks just like my travel pix in Siena too! Made me miss that place! 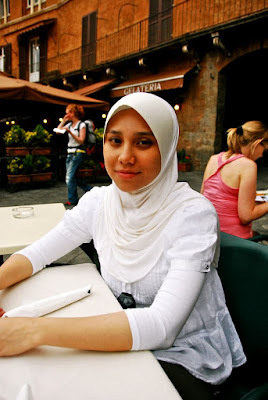 hi Hana.... what other places yang you visit in Siena? is it worth of going there?